Casio announced four new watches for a December release in Asia. The G-Shock GA-110LN Layered Neon Color Series has a matte finish with traditional dark colors for the bezel and outer bands and bright neon colors for the bezel lettering, analog hands, and inner layer of the bands. The bands are created with a mixed molding process that allows both layers to be seen from the side of the watch. The GA-110LN-1A is black with a light blue inner band. The GA-110LN-2A is blue with a yellow inner band. 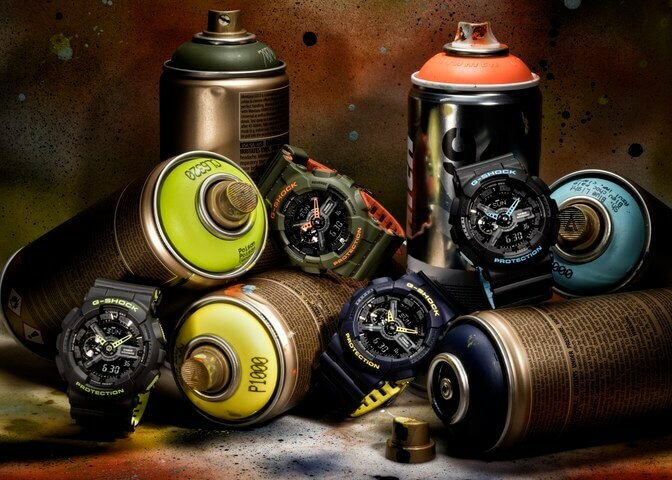 The GA-110LN-3A is olive green with an orange inner band. The GA-110LN-8A is gray with a lime green inner band. The GA-110 measures 55 x 51.2 x 16.9 mm and features shock resistance, 200-meter water resistance, magnetic resistance, auto LED light with afterglow, world time (48 cities + UTC), 1/1000 second stopwatch, 24-hour countdown timer, 5 daily alarms with 1 snooze alarm, hourly time signal, full auto calendar, and 12/24-hour format. Update: G-Shock Japan announced the GA-110LN-1AJF, GA-110LN-2AJF, GA-110LN-3AJF, and GA-110LN-8AJF for a February 2017 release. List price is ¥16,000 JPY each. Update: Casio America announced the GA110LN-1A, GA110LN-2A, GA110LN-3A, and GA110LN-8A for a March 2017 release with a list price of $120 USD each.